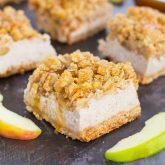 This No-Bake Apple Cinnamon Cheesecake features a creamy, apple spice batter that’s layered on top of crushed graham crackers and topped with tender, cinnamon and brown sugar apples. 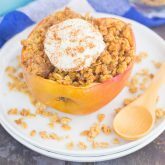 It’s an easy treat that’s ready in no time and perfect for fall! And even though it isn’t officially fall yet, Labor day is now over, so I thought it was acceptable to start shoving some apple recipes in your face. Even if you aren’t in agreement with me, just pretend, ok? I’ve been testing apple (and pumpkin!) recipes since June, and I can’t wait to share some of my newest creations with you. I had a hard time deciding what dish to showcase first, so of course, I went with dessert! And this is one of my favorite kinds of dessert! And you know me, I looove cheesecake! From these Caramel Apple Cheesecake Bars, to that No-Bake Peanut Butter Cup Cheesecake, this No-Churn Cherry Cheesecake Ice Cream, and that Caramel Pumpkin Cheesecake Dip, I love it all. And it seems that you do, too, as cheesecake recipes are wildly popular here on Pumpkin ‘N Spice! 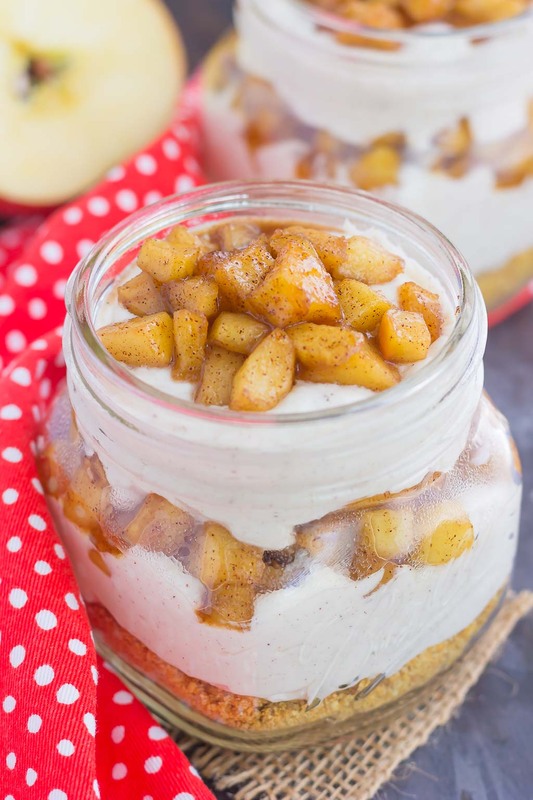 So, it only seemed natural that I take my love for apples (and fall) and create this easy, No-Bake Apple Cinnamon Cheesecake. Fast, fresh, and flavorful, this is the perfect dessert for using up all of those fresh apples. Now, let’s talk about that apple spice batter! I used a hint of apple pie spice to really bring out the apple flavor of the cheesecake batter. And those apples that are studded on top of the cheesecake? Pure deliciousness! 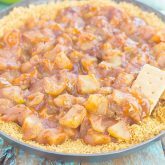 Fresh, diced apples are sautéed in a mixture of butter, brown sugar, and cinnamon, until tender and soft. It makes the most decadent topping for this cheesecake! And just like this No-Bake Pumpkin Cheesecake Trifle, I served the cheesecake in mini mason jars. It just seemed more fun! But, feel free to serve this cheesecake in a regular pie pan or springform pan, if you desire. 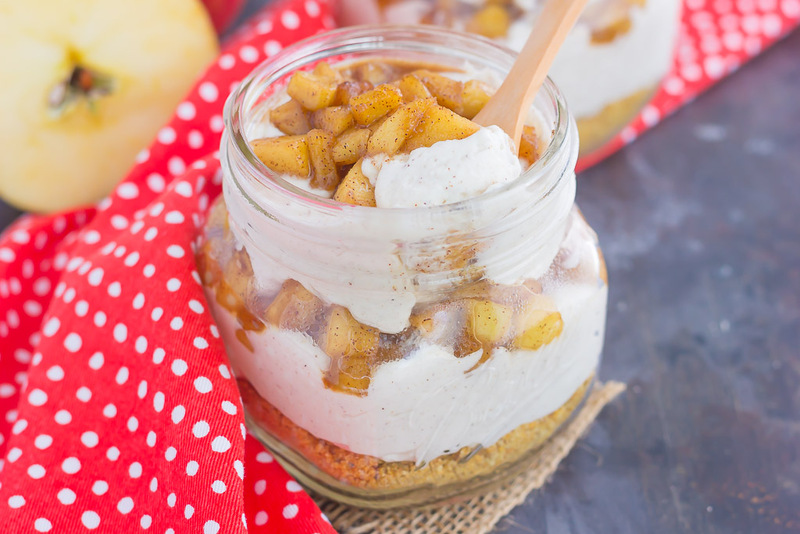 So, kick up your dessert game this fall and make this No-Bake Apple Cinnamon Cheesecake. I guarantee it’ll be a dessert favorite all year long! Looking for more easy cheesecake recipes? I’ve got you covered! 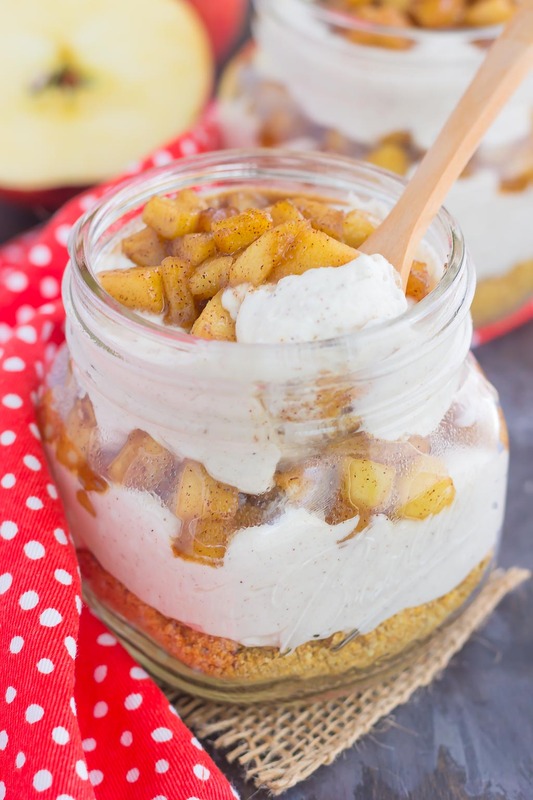 This No-Bake Apple Cinnamon Cheesecake features a creamy, apple spice batter that's layered on top of crushed graham crackers and topped with tender, cinnamon and brown sugar apples. It's an easy treat that's ready in no time and perfect for fall! To prepare crust, in a small bowl, combine graham cracker crumbs, cinnamon, and melted butter. Stir until thoroughly combined. Set aside. To make the cheesecake batter, in a large bowl, combine the cream cheese, heavy cream, white sugar, vanilla extract, and apple pie spice. Using an electric hand mixer or stand mixer with fitted paddle attached, beat mixture until smooth and creamy, about 3-4 minutes. Set aside. 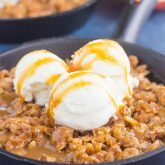 To make the apple topping, in a large skillet, melt butter over medium heat. Add diced apples, brown sugar, and cinnamon. Stir to combine and sauté apples until tender, about 5-7 minutes. To assemble cheesecake in mini mason jars: spoon about 4 tablespoons of graham cracker crumbs onto the bottom of 4 mason jars. Lightly press down with a spoon. Add about 1/4 cup of cheesecake batter on top of graham cracker crumbs, followed by roughly 3 tablespoons of sautéed apples. Repeat with another layer of cheesecake and apples, if desired. Refrigerate until firm, at least 30 minutes, or until ready to serve. To assemble cheesecake in pie form: spread graham cracker crumbs onto the bottom of a 9 inch springform pan and lightly press down. Add cheesecake filling and spread in an even layer, followed by sautéed apples. Refrigerate until firm, at least 30 minutes, or until ready to serve. Bring on the fall recipes! We've been picking apples from our trees for at least 3 weeks, so as far as I'm concerned this dessert is right on time! Sounds delicious, Gayle! Thanks, Blair! That must be so nice to have an apple tree! I'm excited about all the Fall recipes, can't wait to see more! This dessert looks super cute and delicious!!! Thanks, Mira! I'm so excited for fall, too! Feel free to shove as many apple recipes in my face as you like! Loving this no-bake dessert! So delicious!! I've been dreaming up fall inspired cheesecake recipes and an apple version is definitely on my radar. :) I haven't broken out the pumpkin yet but apples are a different story. 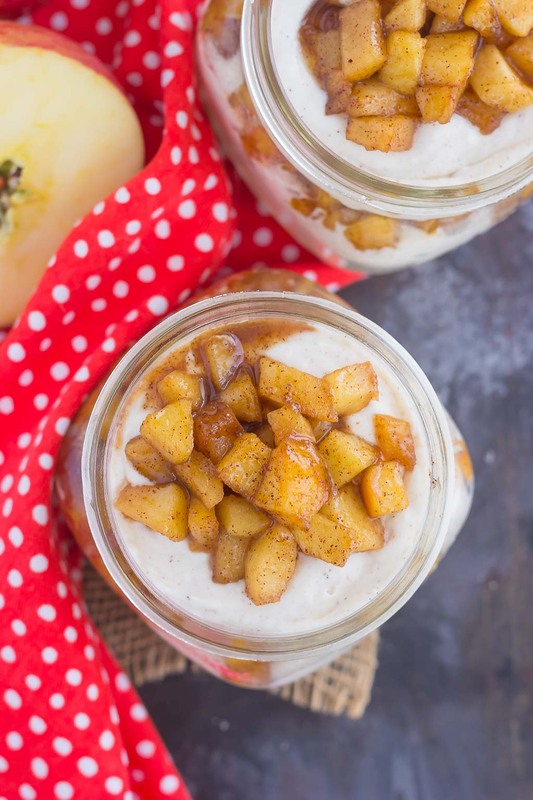 These parfaits are so pretty and I'm loving those delicious apples! I love the little mason jars -- I'd take one of these with me everywhere! ;) And definitely not mad about the fall recipes. Bring them on! I love fall too (fave season) so bring on all the pumpkin and apple recipes, I say!! Love this creamy cream cheese base and perfect paired with apples and cinnamon - such a classic! Pinned! Hope you're having an awesome week, my friend! Oh man, this is like the BEST twist on fall cheesecake I've ever seen, Gayle! I just want to dig right into all that goodness! No time in the oven = quicker to my mouth!! These looks so decadent and delicious; I want a couple jars to myself! No-bake recipes are the best! Thanks, Sues! yay for fall recipes! and no better way to start than this apple cheesecake! It sounds delicious! Thanks for the apple love, Nicole!